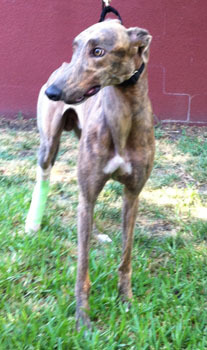 Bronson, aka WW Bronson's Best, is a 3-year-old blue brindle male with gorgeous golden eyes born September 3, 2008. His sire is the Irish-bred Deerfield Site, and his dam is WW's Best. Bronson has 61 races to his credit on Greyhound-data.com starting on April 5, 2010, and ending on August 20, 2011 when he suffered the career ending injury of a fracture of his right central tarsal bone at Gulf Greyhound Park in La Marque, TX. Surgery was performed by Dr. Bob Radasch of the Dallas Veterinary Surgical Center on August 26 to repair the chronic fracture. Bronson's cast was removed on October 20, and x-rays show the fracture is healed. He completed his medical procedures on October 27, and Bronson is being leash walked for an additional 3-4 weeks. This boy is ready to find his forever home! Bronson is not cat tolerant.